To qualify for the handgun carry permit in Tennessee, you'll need to complete an approved handgun safety course within 6 months of applying. Students who complete our TN Carry Permit class will receive a Certification of Completion to meet this requirement. Click here for TN Department of Safety & Homeland Security handgun carry permit requirements.. Although you must be 21 years or older to receive the permit, this class is open to anyone 16 years and older. Students 16-20 years old must be accompanied by an adult. 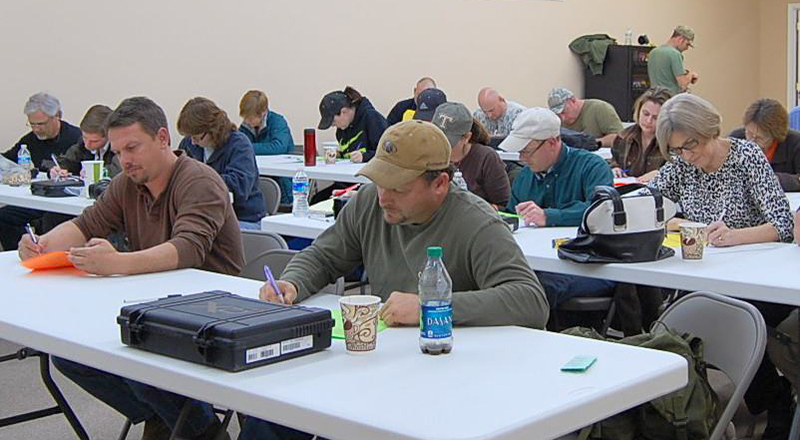 Our TN Carry Permit class includes 4 hours instruction, a lunch break and 4 hours additional support, if needed. You should plan to spend the entire day in class. We encourage you to bring your own gear for the best experience, however we do have all of these items for rent or purchase. Basic handgun knowledge is required for this class. If you don't know the basics, ask about our private lessons. We'd be happy to teach you all about guns and how to shoot them. Should you need to cancel your registration, please let us know immediately. For a full refund, you will need to cancel no less than 7 days before your class date. Should you cancel less than 7 days before your class date, your payment will be applied to a future class or available for in-store purchases. Because our classroom capacity is 32 students, we must reserve the right to cancel your seat. In this case, you will receive a full refund.